Ask the most eccentric students in the school to come on stage and do anything they want to. Hide in your classroom and don’t come out. Invite pupils to perform ‘funny’ impressions of teachers. Conduct the assembly in made up language. Invite a friendly chainsaw juggler to demonstrate his/her skills. Invite members of staff to participate in an impromptu ‘Cirque du Soleil’ performance. Put on a homemade indoor firework display – an extremely bad idea! Have a 200-a-side game of football. Totally deny it’s your assembly- you swapped with what’s-her-name, right? So, how can you put on a great assembly? To shine with a super assembly that will differentiate you from the crowd, you may need to put an effort into delivering an assembly at the level of a proper theatrical production (thankfully shorter though). And for that, you will need a great script. For most teachers, writing their own assembly script is not an option. Whether you’re looking for just funny or funny and educational scripts, you could consider using scripts on this site. Getting a script is just a start – but an important one! 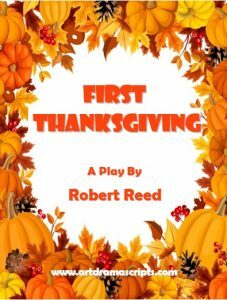 Of course, the original Thanksgiving celebrated by the Pilgrims, in 1621 with King Massasoit and ninety of his tribe featured games as well: displays of archery and musketry, dancing and more besides. The Pilgrims were celebrating the bounty of their first harvest in the New World, which owed so much to the goodwill of their new neighbors. 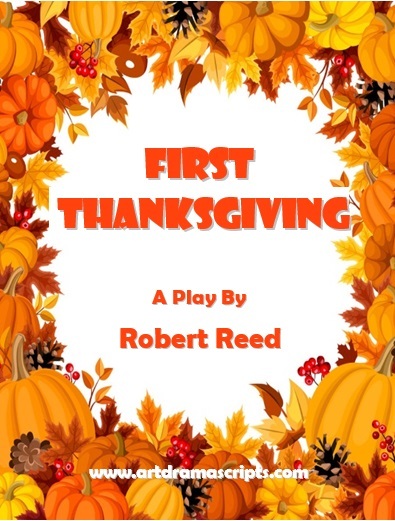 So, on the 4th Thursday in November you might want to prepare some pumpkin pie and check out a very funny play script First Thanksgiving for kids to enjoy and learn more about the journey of the Pilgrims and Thanksgiving. It’s difficult enough deciding what to take for a two week holiday by the seaside, but what would you take on a voyage to establish a colony in the New World? The answer is as much as you can cram into a 35 meter long boat with 102 other Pilgrims plus 40 crew members. In the New World things were desperate, starvation loomed, until some friendly local tribe showed the Pilgrims what crops to plant. Huzzah! It’s time for a celebration of Thanksgiving and don’t forget to invite King Massasoit and his tribe! St Patrick’s Day originally celebrated the arrival of Christianity in Ireland. Nowadays, it’s celebrated equally as a festival of Irish heritage and culture. The celebration is marked throughout the world, not just in Ireland itself. The biggest St Patrick’s Day parade is in New York City; but, Ireland holds the record for the smallest parade! (lasting a distance of 23.4 metres between the only two pubs in the village of Dripsey, Cork). In addition to parades, people celebrate by “the wearing of the green” (shamrocks) and dressing up. This includes wearing ginger coloured wigs and beards and looking like mischievous leprechauns- who are said to love collecting gold. [Hmm, that’s a bit like international bankers, but when bankers get up to mischief they wipe a few trillion from the global economy.] If you’re feeling energetic, you don’t have to be a member of Riverdance to try Irish dancing and appreciate Irish folk music. If you would like to use a Frankenstein story with children, there is a funny version Mrs Frankenstein M.D. available as a role play here: http://artdramascripts.com/halloween_kids. If you have an assignment to write on Frankenstein, and need a little help, visit: http://www.sparknotes.com/lit/frankenstein/ . Yep, even back in the early nineteenth-century people were wary about what scientists were getting up to in their labs and we can consider Frankenstein as not merely a horror story, but also one of the earliest works of science-fiction. They explored and colonised islands in the North Atlantic even reaching as far as Newfoundland in Canada. They had a profound effect on British and Irish history in particular. They traded along the Volga River and as far south as Baghdad. Many of their exploits were recorded in Icelandic sagas and on rune stones. They were famous for ferocity in battle: the word berserk comes from the Norse habit of going completely loco in combat. However, conversion to Christianity slowly curbed the Vikings of the more anti-social aspects of their behaviour, much to the relief of their neighbours. Generally speaking, it’s probably best for your health to invite your Viking friend to join a yoga club, or maybe take up knitting. Scripted for use in the assemblies, read about a funny Viking story Don’t Argue with Eric http://artdramascripts.com/ks2_playscripts/vikings. There were three styles of play, or genre: tragedy, comedy and satyr [yes the spelling is right here]. The Ancient Greeks were most famous for their very, very serious tragedies. Almost always someone died, and there was a moral to teach the audience: you know something like don’t eat all the custard, or everyone will get the plague. By custom, there were a maximum of three actors and a chorus (who sung and narrated). Some things never change in the world of entertainment: Homer’s epics were greatly in demand back then as well… okay, so it was a different Homer to Bart’s dad. Anyway, one final thing about Ancient Greek theatre was that it was central to religious festivals, especially in honour of Dionysus (the god of wine and having a good time). If your class are researching the Ancient Greeks, I recommend visiting this site: http://www.bbc.co.uk/schools/primaryhistory/ancient_greeks/. Would your class like to be Ancient Greek heroes in a super comedy? If the answer is ‘yes’, here’s the perfect script for you: http://artdramascripts.com/ks2_playscripts/greeks. Palm trees, surfing and people greeting each other with “aloha”, you can only be in one place in the world… Welcome to Cornwall! It’s a county located on the south-west peninsula of Britain. Okay, so it might be a bit similar to… what’s-it-called? Ah, yes, Hawaii. But, still Cornwall -or Kernow, in the local language- is a great place to visit. The climate is the mildest in the UK thanks to the Gulf Stream and there are miles of sandy beaches. Cornwall is famous for its fish dishes and cream teas. Tourist attractions include the Eden Project and Tintagel Castle, legendary home of King Arthur. Well, a lot of other places in Britain claim to be the location of Arthur’s castle where he entertained round knights; however, for my money Tintagel is the real deal. He just travelled around the country frequently because he was so famous, that’s all. I know Hawaii Five-O wasn’t shot in Newquay, but if it had been, I’m sure Detective Lieutenant Steve McGarrett’s catchphrase would have been different: something like, “Get me a pasty, Danno!” I like Cornwall, so I wrote a really funny play script to celebrate St Piran’s Day. Enough said. For teachers from Cornwall – special assembly play about Saint Piran and the Cornish Piskies http://artdramascripts.com/patron_saints. There are some fantastic pictures of scenery and places to visit in Cornwall at http://www.visitcornwall.com/ . Everything you need to know about the Tudor dynasty in 365 words!